Similar to the Passion Fruit Cheesecake Truffles I made, I started with my go-to cheesecake recipe. After baking, the cheesecake cools and then is smashed up in a large bowl. I added crushed pineapple and cream of coconut to the bowl along with crushed graham crumbs for the right truffle consistency. The mixture is then left to chill and set up a bit before scooping and then rolling in a coat of toasted coconut flakes. The end result is a pretty easy cheesecake truffle with a nice contrast of textures! Now if you're looking for convenience, skip making the cheesecake from scratch and use a frozen pre-made cheesecake. Preheat oven to 300ºF. Combine graham cracker crumbs, sugar and butter in small bowl; press firmly into bottom of ungreased 9-inch springform pan. Beat cream cheese in large bowl until fluffy. Gradually beat in sweetened condensed milk until smooth. Add eggs and lemon juice; mix well. Pour into prepared pan. Bake cheesecake in the preheated oven for 50 to 55 minutes or until center is set. Cool for 1 hour and then chill for at least 4 hours or overnight. Place the chilled cheesecake, crushed pineapple and cream of coconut in a large bowl and mash up until fully combined. Add 1 cup of graham cracker crumbs to the bowl and stir until you have a consistency of a loose cookie dough that will hold it's shape when rolled into a ball. You may need to add more crumbs so go by feel. Cover with plastic wrap and chill mixture for at least 2 hours to set and allow flavors to meld. Using a small scoop, scoop mixture from the bowl and roll into a small ball with your hands. 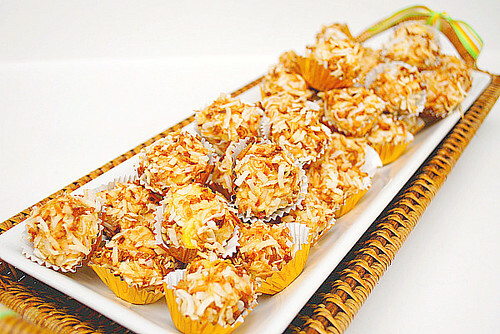 Roll each truffle in the toasted coconut flakes to coat. Serve chilled or at room temperature. Yum. Any of those flavors would be amazing on their own and sound great when turned into these truffles. That is a really cute idea. I have seen the cookies and cream truffle but not like this. just wondering, could I just use cream cheese instead of cheesecake? Anonymous - I haven't tried it with just plain cream cheese, but I believe Philadelphia brand makes a cheesecake filling you can use as a substitute!